You are a lifesaver!!! Thank you for taking the time to write this. It worked the first time. The step I was missing before was using the signature enforce software to batch the sys file. Thanks again! @SIRacer09 I followed your steps and it worked flawlessly. Everything stick even after rebooting - I'm glad I didn't upgrade to 10. Thanks for your step by step guide! @boysie thanks for posting the xfx from - with ethi 16 and dcri 40 I'm getting 28.835 eth and 576.669 sia. Seems stable so far, and the whole rig uses about 25 watts less at the wall (4 gpu total, 1 card flashed). Can someone put the links to the modded roms? Then we got everything in one place Think I found what I was looking for but I had to go thru the entire thread found a 480LowEnergyOK.zip file. SOmeone tried it? Did you change anything via Wattman? I tried using the same ROM for my XFX but am having issues. Please let me know if there was anything else you modified? @Extrastarka yes i've been using that rom for days now. Works great! @K0lebas your memory is clocked too high for your core. Drop your memory down to 2125 @ 930mv. Put your core up to 1160 @ 975mv (these are solid values) - Put your fan down to something like 3500... maybe 4000 if you live somewhere warm. It should be stable.. and giving less heat. Card will throttle you when you reach 75c so set target GPU temp to 65c as well or edit ROM and increase temp to 80. Also increase minimum fan speed from 1200 to 2200. Modify as required to keep temp low and card won't throttle. 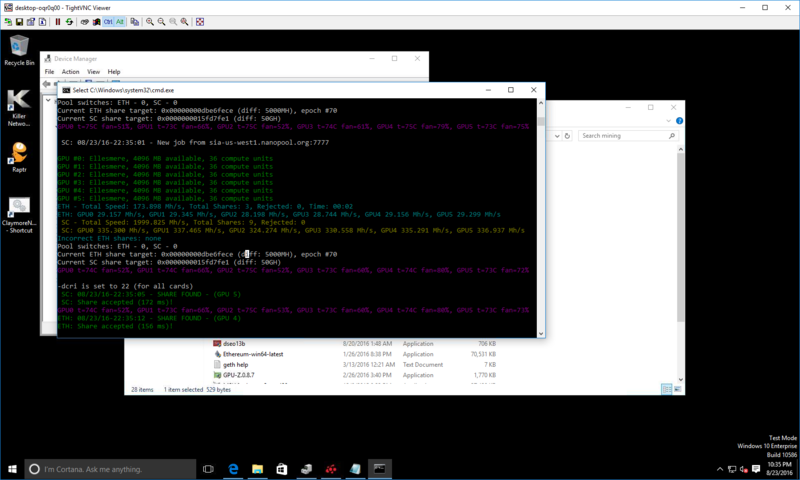 And where i can download @Heliox rom for windows10? 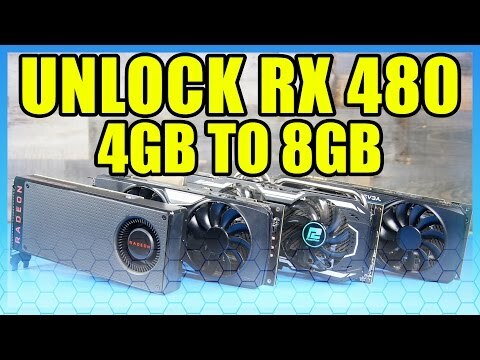 It works for GIGABYTE Radeon RX 480, 8GB GDDR5?///Sapphire Radeon RX 480 8GB? If you are able to sign the .sys file in windows 7 then you are able to sign the win10 .sys file while in win7 and export your local cert in win7 and import it to windows10 as a trusted and use the win10 driver signed by your now trusted windows7 cert. The only thing I can think that would prevent this is the singing process might be different for a win10 driver and there for not work but I don't know how that works in the first place...but would be fairly easy to try? There is a good reason why you would want to only do this with your own cert though as you would risk installing a publicly available cert and trusting that would be bad. EDIT: It looks like from your steps the same patched file can be used on win7 and win10 and there for the same self sig driver can be used on win10 if you export your cert from win7 and import it as a trusted cert. is the low energy ROM Flash with all 480 8gb cards possible? MSI Radeon RX 480, 8GB GDDR5, HDMI, 3x DisplayPort (V803-862R)? I just can't get this to work with win7, get error 41 or 43 in device manager. Anyone else? @koorpa - I had error 43 after I flashed, but all was well after steps 13-15. @nhando - I reset wattman and didn't use it after - I use claymore to run my fans at 75%. Nothing else modified. I used boysie's sapphire rom and copied the values to the backup of a rom from one of my powercolor 8gb 480's and flashed - I'm at 28 eth and 570 sia for all three of the PC cards. The fourth card has his xfx rom - I'm pulling 950 watts from the wall for the whole rig. Billcryptokid was able to get 30+ ETH and 400 Sia using boysie ROM with some wattman tweak. That's what I want to achieve! This current wattage I think I should be able to do 7 x RX480 using my MSI Gaming 5 MB powered by just 1 EVGA 1300 but I need to get a stable setting first. 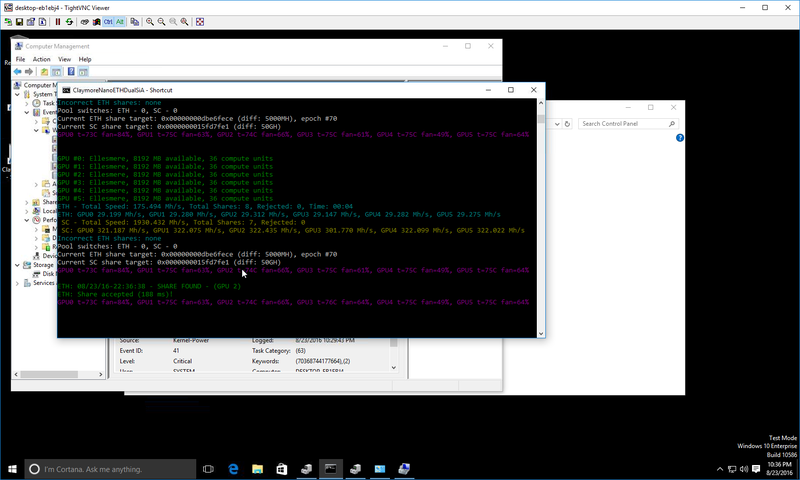 Testing another XFX card now with the Boysie ROM, will also test PowerColor using Bitcointalk Heavy Rom which is what Boysie's ROM is modified from and a Sapphire card. Will update more once testing is complete as I have many brand to test. I'm making good progress and I think I figure out what the issue may be now. Sorry for asking the noob questions. I have 6x xfx rx480 4gb (first ones), 6 xfx rx480 8GB, 8 sapphire rx480 8GB and 3 powercolor rx480 8GB. Can i flash an all the same low energy rom? 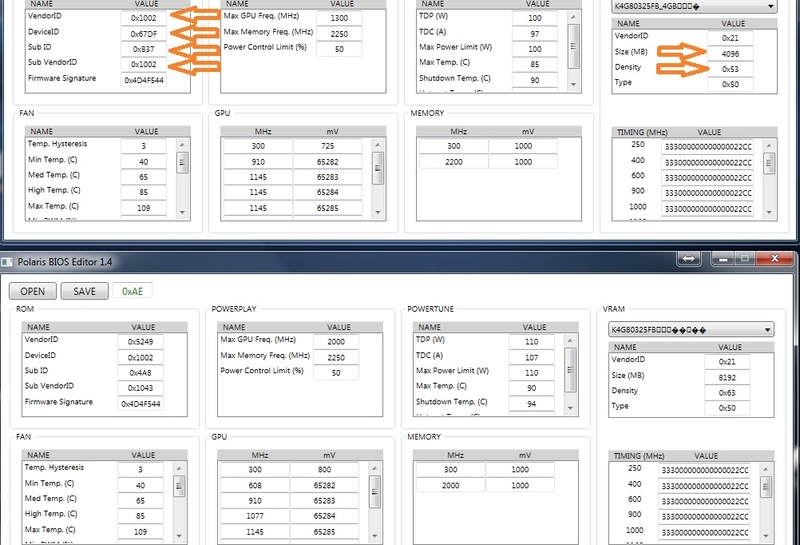 @Dr_House86 my question to you would be, "how in the.... did you get all them 480's?" so do i need to correct optimized rom with these values, or it can be flashed directly? and this signature checking problem, is it for win 10 only ( i am on win 7)? I would just change the vendor stuff and leave the stuff on the right alone. or do what I did and edit your own BIOS and put in all the changes Heliox and I did (mostly heliox) that way you have your bios with the required changes and it will def work..
ok this is my question, what were the changes ? I need to apply these changes to the six different 470s I have lol. From the pics above it seems the timings were not changed but the guy who modified a 470 nitros to get 27mhs sai something about changing timings and if you look at his images the timings are different. Anyone running a full rx480 8gb rig with low power mod bios, able to give me a KillaWatt reading? Preferbly dualmining with Claymore if possible, thanks! I was using around 3.5 (17 amps at meter then when mining 19amps sometimes 20 is how I got this number) amps for six cards to mine. @Heliox i can take your settings from your roms and put same settings in red devils rom with the bios editor, or are they too different?? Ahh nice, I am using a 1050W PSU as well. So I presume you are using the low power mod bios yea? Let me summarise what you did. 1. You flashed all cards with Low Power Mod bios. 3. Run Claymore and drool at the increased Hashrate and Power efficiency. Have yet to try out the Mod for my 480Ref Rig, running on 27Mh / 330sia per card , 980W at the wall. On stock Bios with @boysie 's old Power saving Wattman settings. @ShawnY youre correct although not quite in that order after i moddded the bios i did a clean install then used that windows 7 driver sgining tool after i copied down the modified driver. anyone can help to restore the gpu at least ? Can you share the link of this ROM you're referencing that gets 27MH / 330 SIA. How much does it get ETH only. That will probably help me identify the ROM. Test 2 - 2nd XFX card only - No issues handling any of the ROMs including the Heavy ROM 31.8ETH only Romsie ROM that can also do 30.3MH plus 440 Sia. This is the ROM I WANT to get working BADLY!. After this success and it ran stable overnight, I then started flashing and testing over 15 more cards. I made sure they all can run stable at least for 2-3 mins before moving to the next card as my first test with the XFX shows that if it's going to fail, it will normally fail within the first min via overheating or other issues. I flash a total of 19 cards. Found 1 card that can't handle the heavy ROM (First card tested). Found another card that end up with a dead fan (Sapphire). So please proceed understanding there are higher risk involved with the higher OC ROM vs the low power one. You should also check to make sure the SATA connectors are not overheating. I had 2 burn out due to cheap cables that may have gotten loose and crossed causing a small fire but it didn't damage the PSU or GPU. Replacing the Molex power cable fix the issue but it did a temporary nervousness. From this test I noticed that some brand prefer certain temp level before performance start dropping and it could range from 80-84 so I set my Claymore to -tt 79 which comes at the cost of noise. Again you will not have this issue with the low power ROM but I want maximum performance as my power is cheaper so I want 390 performance. Rig 1 - MSI Gaming 5 Motherboard which can handle 7 GPU - All PowerColor cards. I get constant reboots after 4-30 mins. I don't know why. Sometimes it will crash saying Ethermine.exe failed, other times it just reboots itself which you can't set to autostart due to the signature thing. Rig 3 - ASROCK H81 BTC Pro - 5 Sapphire card but 1 die with the FAN issue so it went down to 4. Fail with similar issues above. I'm open to suggestion but I've tried many things like increasing power limit to +10 and setting temp max to 76 forcing Claymore to run fan at 100% to avoid overheating etc. I want this to work. It's very addictive when you see the # reported for 7 GPU at this high rate which is comparable to my 390 Rigs. Will add screen capture of hashing results soon. Going back to the 30.5MH ETH Only ROM for now to see how stable that is for multi GPU. Iam not really happy with the roms, i tried a lot but nothing is near my expections. The low power ones are crap for dual mining and the high power ones are to hungry. 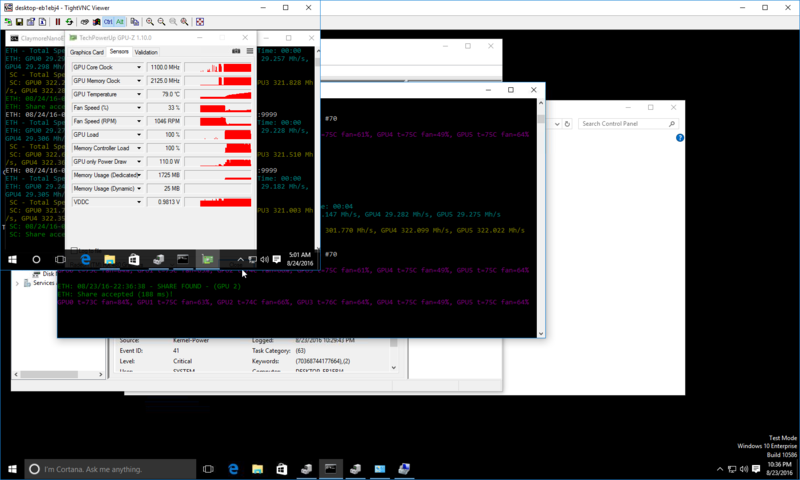 On windows i run with 160mh/s eth, 2000mh/s sia with 1050w @ wall.